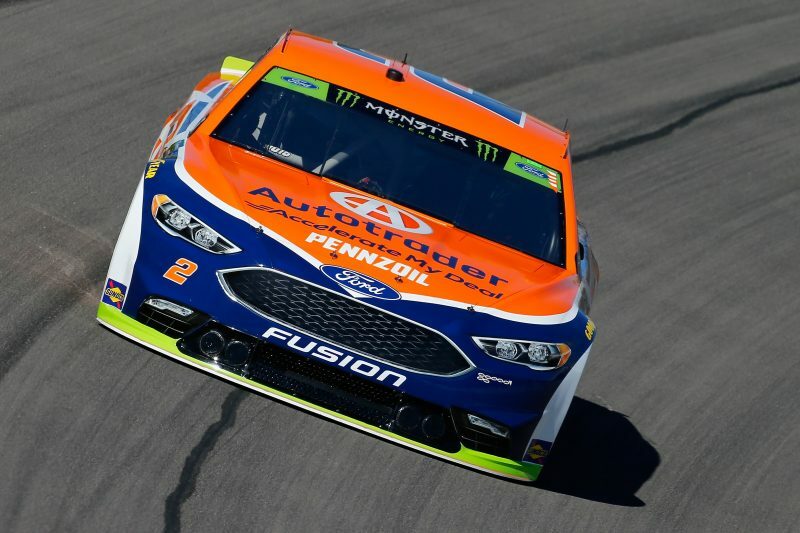 Brad Keselowski has picked up a third consecutive win and delivered Team Penske its 500th in all series in a bruising Las Vegas NASCAR Playoff season opener. In a South Point 400 in which several of the big name Playoff contenders found trouble, Keselowski (#2 Ford) beat Kyle Larson (#42 Chip Ganassi Racing Chevrolet) after a succession restarts late in the race. Defending champion Martin Truex Jnr (#78 Furniture Row Racing Toyota) finished third while Joey Logano (#22 Ford) and Ryan Blaney (#12 Ford) made it all three Team Penske cars in the top five, in third and fourth respectively. The first of the 16 drivers in Playoff contention to come to grief was Kevin Harvick, who fired into the Turn 1 wall on Lap 148 after blowing a tyre in the final moments of Stage 2. Pole-sitter Erik Jones (#20 Joe Gibbs Racing Toyota) was caught up and followed Car #4 into the outside wall before piling into the rear of the Stewart-Haas Racing Ford , with Harvick blaming ‘piece of crap tyres’ for the crash which eliminated both. Keselowski led the field back to green with four laps left in Stage 2 after winning the race off pit road under the Caution for Harvick’s accident. The Ford driver grabbed the Stage 2 win ahead of Kurt Busch (#41 Stewart-Haas Racing Ford) while Stage 1 victor Truex Jnr was third. In the early part of Stage 3, Truex Jnr reclaimed the lead from Keselowski with an inside move before the carnage kicked off. On Lap 212, Chase Elliott (#9 Hendrick Motorsports Chevrolet) became the third Playoff contender to get taken out of the race after being collected by a spinning Jamie McMurray (#1 Chip Ganassi Racing Chevrolet), who had cut a tyre when he touched the wall one corner prior. It sent the #9 hard into the outside wall, making right side contact before coming to a halt on the top of the banking. Keselowski swapped the lead with Logano and Larson in the two following Cautions for Playoff contenders Kyle Busch (#18 Joe Gibbs Racing Toyota) and Denny Hamlin (#11 Joe Gibbs Racing Toyota), who spun off Turn 4 and ploughed through the infield grass in separate incidents. The #2 regained the lead on the subsequent restart following a tense three-wide battle moments before a late wreck involving Playoff drivers Jimmie Johnson (#48 Hendrick Motorsports Chevrolet), Clint Bowyer (#14 Stewart-Haas Racing Ford), Alex Bowman (#88 Hendrick Motorsports Chevrolet) and Kurt Busch, among others. A red flag was thrown for the clean-up of the incident, pushing the race into overtime, but Keselowski managed to hold onto the lead on the restart and claim his 27th career win. He is now locked into Round 12 of the Playoffs. Aric Almirola was the best of the rest in sixth, followed by a recovering Kyle Busch, Daniel Suarez, Ryan Newman and Paul Menard who competed the top 10. Of the 12 Caution periods in the race, five came in the last 40 laps, with barely more than half of the 16-driver Playoff contingent finishing in the top half of the field. The second of three races in the Round of 16 takes place this weekend at Richmond Raceway (September 21-22 local time).